I’ve been hard at work on this for the last 7 months and it’s finally time for a beta release! There’s a lot of small- and medium-size things all over the place There have been some significant performance improvements to some important effects, especially those in the Blur menu. There are also a lot of quality-of-life improvements, some great bug fixes, and the ability to perform copy and paste operations on the selection, among many other things. I’ve also been making a lot of improvements “under the hood” that won’t really be visible, but that will make it easier and faster for me to make progress on features and other performance improvements. GPU-powered Effects! Some of the effects have been rewritten to use Direct2D’s image processing system, and the results are phenomenal for performance. Gaussian Blur is actually fast now and no longer takes ages to complete for large images or radii, and the same goes for both Motion Blur and Radial Blur (although Radial Blur does currently need a pretty powerful GPU). A few other effects were converted for the sake of completeness and for my own learning, and there are two new ones (Morphology and Turbulence). This is where most of my time (the aforementioned “last 7 months”) and sweat was spent: getting a GPU-based effect rendering system up and running end-to-end was no small feat! Expect to see more effects converted over to the GPU in subsequent updates as this tech matures. I am also planning to make the GPU available for plugins to use in a future update. 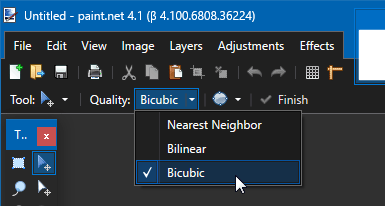 New: Bicubic resampling is now supported for the Move Selected Pixels tool. It is very CPU-intensive, so a CPU with 6 or more cores is highly recommended. Changed: The Text tool now uses Points for font size measurement. You can also elect to use the old font size metric, “Fixed (96 DPI)” via the dropdown to the right of the font size. Changed: For Windows 7 SP1 users, the Platform Update from 2013 is now required. New: Palettes are now also loaded from Documents/paint.net App Files/Palettes. This folder name is not localized, and so is easy to rely on for installation scripts. Edit: This is now in effect for version 4.1. There was no 4.0.22 release — it was renamed to 4.1. I wanted to give a heads up that the next update for Paint.NET, version 4.0.22, will require that Windows 7 users have something called the “Platform Update” installed. Later versions of Windows, meaning 8.1 and 10, do not need this because they already have what it includes. If you’re using Windows 7 then you probably already have this installed and I wouldn’t worry about it; Windows Update should have taken care of that a long, long time ago. KB2670838, as it’s called in some circles, is over 5 years old at this point This will be more relevant to folks who are setting up new installations of Windows 7, and is especially important for sequencing of auto-install or deployment scripts, because the Paint.NET installer will not handle the installation of this dependency. In this case, the Platform Update includes significantly updated versions of Direct2D, Direct3D, DirectWrite, Windows Imaging Component (WIC), Windows Advanced Rasterization Platform (WARP), and Windows Animation Manager. Paint.NET uses all of these, and especially the Direct2D v1.1 update brings a lot of new features that will be very beneficial. One of the projects I’m working on is to use the GPU much more aggressively in Paint.NET. Right now the GPU is mostly just used to blit the canvas and draw decorations on top of it. I’d like to go further, starting with the use of Direct2D v1.1’s effect system for, well, effects. I’ve got a prototype up and running that surfaces a few of Direct2D’s built-in effects as Paint.NET effects and the performance is very promising, even when using WARP (software rendering). It also appears to automatically work with SLI, although I still need to do some benchmarking to confirm any actual performance increase. If this works out well then you can expect more use of the GPU throughout Paint.NET as updates trickle out over time. 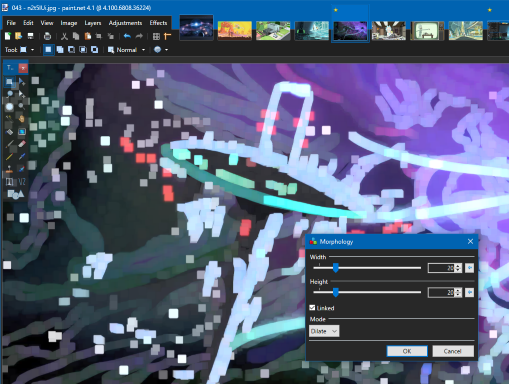 This update fixes one major bug in Edit -> Paste that was introduced in 4.0.20.
paint.net 4.0.20 is now available! 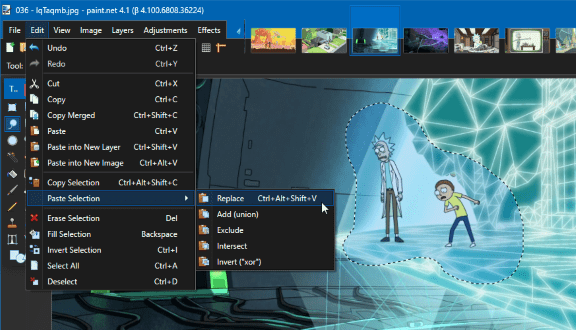 This update adds a new Dark Theme, significantly improves High DPI support, adds Explorer thumbnails for TGA and DDS image types, and also includes a whole lot of small improvements and bug fixes. If you’re using the Windows Store release, you should get the update automatically within the next day or so. It’s been about 2 months since 4.0.19 was released, and I wanted to share what I’ve been working on for the upcoming 4.0.20 release. First, there is the usual bag of bug fixes and minor improvements. I’ve also focused on fixing up a whole lot of lingering issues for high-DPI, especially at 200%+ scaling which is becoming more and more important. I’ve got my own laptop with a 4K screen now, so this is much easier for me to hack on. I’ve upgraded the shell extension so that it can now provide thumbnails for TGA and DDS file types. This takes advantage of the recent upgrade (in 4.0.18) to the shell extension that allows it to run out-of-process, which means I can now host the .NET runtime and use the “real” code that Paint.NET already has for loading TGA and DDS images, and for resizing them down to thumbnails. This screenshot also illustrates some of the improvements in High DPI support for the main window. Namely the thicker highlight outlines, and de-claustrophobization of the toolbar and other areas. I resisted implementing better theming support because I was sure that the amount of work just wouldn’t be worth the payoff and that it would introduce a large number of really annoying bugs, and that it would be an ongoing engineering tax. But now that Windows 10 has a built-in Light/Dark theme selector, and since I’ve been getting a steady stream of requests for it, it’s now clear that it’s worth the effort. Plus I get a lot of value out of Visual Studio’s and IntelliJ’s dark theme support, which has also helped to convince me. And it has been a lot of effort to get this working with a legacy WinForms codebase! Every single UI control has needed its own special coddling to support background and foreground color changes, both statically and dynamically. After over a month of working on it in my spare time, I’m getting close to finishing it and can hopefully push it out the door in time for Christmas. By the way, Dark Theme will work on Windows 7 as long as you are using Aero, but it won’t work with Classic. On Windows 10, as long as you have the Color Scheme set to Default within the app, Paint.NET will automatically switch between Light and Dark based on what’s chosen in Windows 10’s Settings.